The proposal was submitted to the NASA Institute for Advanced Concepts ("NIAC") with the title "Antimatter Driven Sail for Deep Space Missions" (For anyone interested in applying for a grant, note that NIAC was shut down in 2007 and subsequently resurrected in 2011 as the NASA Innovative Advanced Concepts program). In the proposal we asked for $74,888 to fund 6 months of work. For the Phase I study, the design mission was to deliver a 10 kg instrument payload to 250 AU within 10 years. The 10 kg payload was assumed based on work done at JPL [Deutsch, L.J., Salvo, C., and Woerner, D., "NASA�s X2000 Program - an Institutional Approach to Enabling Smaller Spacecraft" and Hemmati, H. and Lesh, J.R., "A Combined Laser-communication and Imager for Microspacecraft"]. The mission was assumed to be a fly-by mission although the ability to tack or to stop at the final destination is within the capabilities of this concept. Consequently, the average velocity of the spacecraft was taken to be 116.8 km/s. Click on the figure to expand it. As stated in the proposal, many of the major questions in astrophysics, instrumented probes will have to be sent deeper into space, carry more instruments, and make faster trips -- in essence they must achieve much higher velocities than currently deliverable with today's technology. Missions to the Kuiper Belt, the heliopause, or the Oort cloud will require a revolutionary advance in propulsion to achieve their goals within reasonable time frames. In essence, future missions to deep space will require specific impulses with tens of thousands of seconds and specific masses of .01 to 1 kg/kw. Only two technologies available to mankind offer such performance -- fusion and antimatter. Current research in fusion, including both inertial confinement and magnetic confinement, has not achieved energetic breakeven and requires large, massive machines to generate the plasma conditions. By considering the use of antimatter, researchers have historically had the options of heating the rocket exhaust directly [S.D. Howe and J.D. Metzger, "Survey of Antiproton Based Propulsion Concepts and Potential Impact on a Manned Mars Mission," AIAA Journal of Propulsion and Power, Sept. 1988] or using the antimatter to ignite fusion reactions (such as AIMStar) to create the thrust. We have conceived of an alternative propulsion mechanism that uses a unique aspect of antimatter: the ability to cause fission. Antimatter has the highest specific energy of any source known to man. At nearly 1017 J/kg, it is two orders of magnitude larger than fusion and ten orders of magnitude larger than chemical reactions. Although currently produced and stored in small quantities (1012) using Penning traps, antimatter must be stored in much higher densities to be applicable for missions into the outer realms of our solar system. Currently, research is underway to develop high-capacity storage of antimatter in smaller, lighter electrostatic traps or in the form of antihydrogen. However, even if proven successful, no propulsion system has been demonstrated that would convert the antimatter into usable thrust. The utility of the antimatter sail over traditional nuclear rockets can be explained by invoking the Tsiolkovsky rocket equation. Based on the physics principal of conservation of momentum, the rocket equation allows one to calculate the change in rocket velocity ΔV when a given mass of fuel is expelled at a velocity relative to the rocket of ve. While the exhaust velocity of the fuel mass sets the scale of the rocket velocity change, the ratio of the initial total mass of the rocket over the final total mass of the rocket also has an impact. Evaluating the rocket equation over a range of fuel masses, the graph above to the right is generated. Note that the ship mass includes the masses of payload, propulsion system, framework, solar cells, unexpended fuel, etc. The only item not included in the ship mass is the mass of the fuel expended. From the graph it is clear that it is possible for the change in ship velocity to exceed the exhaust velocity by as much as a factor of three. Fission is the process by which an atomic nucleus splits into two or more daughters, multiple neutrons, alpha particles, electrons, and gamma rays. Most of the energy released by fission is in the kinetic energy of two daughters. Again invoking conservation of momentum, a nucleus at rest produces two daughters of equal momentum travelling in opposite directions. Assume a thin sheet of depleted uranium U238 upon which a carbon coating is applied on the back side. When antiprotons (physics symbol P) drift onto the front surface, their negative electrical charge allow them to act like an orbiting electron, but with different quantum numbers that allow the P's to cascade down into the ground orbital state. At this point the annihilates with a proton or neutron in the nucleus. This annihilation event causes the depleted uranium nucleus to fission with a propability approaching 100%, most of the time yielding two back-to-back fission daughters. The kinetic energy of each daughter is approximately 1 MeV/amu (1 million electron volts in each proton and neutron). Note that one electron volt (eV) is the kinetic energy a single proton gains when it accelerates between two grids held at a differential voltage of one volt. 1 MeV is the energy a proton gains when accelerated across the gap between two electrodes held at a differential voltage of 1 millions volts. A fission daughter travelling away from the sail at a kinetic energy of 1 MeV/amu (1 million electron voltes per neutron or proton) has a speed of approximately 13,800 km/sec, or 4.6% of the speed of light (also known as the relativistic parameter β). If every fission daughter that left the sail travelled perpendicular to the plane of the sail, the parameter β would also be the rocket equation exhaust velocity parameter ve. The value of Q is shown above. Note that Q has a value of just over 0.4. Therefore for this propulsion scheme the exhaust velocity is just under 2% of the speed of light, or 5,600 km/sec. At the nominal value of go of 9.8 m/sec2, the specific impulse Isp of the antimatter-driven sail is 570,000 sec when antiprotons annihilate at the sail surface. As seen in the figure to the right, chemical rockets have a specific impulse of roughly 300 sec and nuclear rockets that heat hydrogen before expelling it is approximately 1000 sec. It is exactly this theoretically astronomical specific impulse that makes antimatter-driven sail research so important! The rest of this web page is devoted to the research results funded by the NIAC Phase I grant. It is possible to accelerate the antiprotons such that they penetrate beneath the sailn surface, causing fission within the sail. If neutral atoms of uranium are blown off in each fission event [3,4], then the energy of the event may be distributed among the blow-off mass. The result is that the momentum transferred to the sail is higher and the specific impulse is lower. Potentially, the number of atoms ejected per fission may be determined by the depth of penetration of the antimatter atoms which is determined by controlling the energy of the incident beam. Thus, the specific impulse of the system may be controlled or adjusted to match the requirements of each mission. Consequently, we performed a parametric study using the number of atoms ejected per fission ("Nat"), as a free parameter. The above figures shows the results of this study. The left figure shows the specific impulse as a function of Nat. It was assumed that the energy released in fission is equally distributed among the atoms ejected. The middle figure shows the dependence of the mass of antimatter required to perform the mission. The figure clearly depicts a minimum for Nat equal to around 15,000. 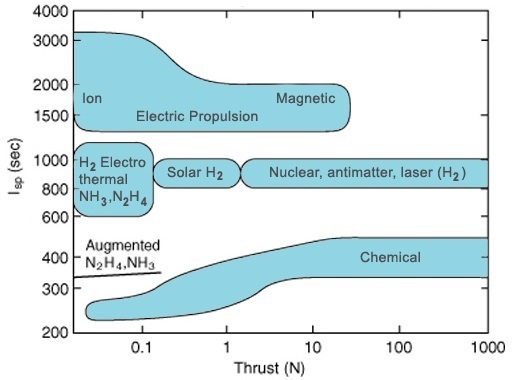 This corresponds to a specific impulse of almost 7500 s. The right figure shows the masses of the uranium fuel and the spacecraft as a function of Nat. For Nat equal to 1, the specific impulse is over a million seconds and the fuel mass is small compared to the ship mass. As the specific impulse gets below 10,000 s, the mass of the fuel begins to dominate the ship mass. For the mission under consideration, the optimum value for Nat, i.e. where the number of required antihydrogen atoms was a minimum, occurred at Nat=15,000. This value is within the range measured in previous experiments. Thus, for the system studies, we used the value of 15,000 atoms per fission. The culmination of the results of the integrated system studies is shown in the above figure. The spacecraft has a sail that is composed of two layers- a carbon backing (sail) and a uranium coating (fuel). The entire sail is 5 meters in diameter. The carbon layer is 15 microns thick ( 34 g/m2) and the uranium is 293 microns thick. The total mass of uranium is 109 kg. The large area of the sail removes the requirement for active cooling. The sail is assumed to dissipate waste heat passively via black-body emission. We assumed an emissivity of 0.3 for both the carbon and the uranium. The steady state temperature of the sail would be 570 C, well below the melting point of uranium.